"Areas along streetcar routes thrive. I don't know anyone who thinks the streetcar is a bad idea now that they've seen it run." - Jay Self, director of Savannah's tourism and film services department. That looks to be a portion of Riverwalk and makes lots of sense..........system like that here in Jacksonville would be a boon for sure! I think the fare being free is a big advantage. I know it seems like collecting some of the cost is better than none but then some politician can fool the simple minded about how it doesn't turn a profit. I would love to see a REAL trolley here. But I don't know if any of the city leaders have enough of a brain to know this is a good idea. Theres no need for it here. 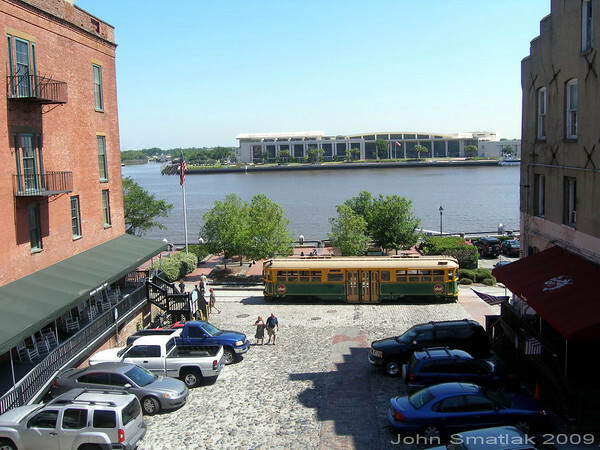 The trolley makes good sense for Savannah, it only runs along river street and provides service to the tourists and locals hitting the bars and shopping. It doesn't run anywhere else, though it seems like a line down to forsyth park or to the other downtown parking lots would make sense. We do sort of have a trolley, the skyway, no one uses it. Your friendly neighborhood Hot Rod! Theres no need for it here. The trolley makes good sense for Savannah, it only runs along river street and provides service to the tourists and locals hitting the bars and shopping. A trolley could run along Water St/Independent Square, then turn up at the Hyatt and hit the corner of Bay Street to service the 'town center' there. Thanks MetroJacksonville/Lake/whomever for that neat little 'what-if' graphic. Civil - that graphic right there could be the Jax translation of Savannah's line. It'd connect bay Street, the Landing, the T-U, the Omni, and CSX and 550. I respectfully disagree with your statement of we have "no need for it here." IMO, this graphic screams the exact opposite. And it'd be a great starter line. 'Cause it doesn't link much together. One Saturday not too long ago, on a family outing to downtown, we parked the car near the Prime and rode the Skyway over to San Marco Square, walked to the MOSH, hit RCBC for a late lunch, hit the Skyway back to the Prime, and left. Made a day of it. Good times. So there's two destinations, really, that the Skyway hits: The Prime and MOSH. Can Hemming Plaza be considered a 'destination'? Either way, most people don't consider any of those as such. It's partially, at least, a public perception problem as well. I've never treated the skyway as the same to a trolley. I guess I like the nostalgia of the trolley, plus it would have more frequent stops, where the skyway stops are not as closely together. Plus i've never been a skyway supporter, should have left it at Disney. Yeah water street at 9 pm on a tuesday, is just like River street at 9 pm on tuesday And goodness knows that on any random saturday its just the same. Please the foot traffic on river street in savannah exceeds water street to such a degree that its comical. Doctor K, Hemming itself is not a destination, but the Library and Moca Jax are just across Hemming from the station, so I would say that it is one of the best stations on the line. I love the idea of running a streetcar down water street with its terminus at the Hyatt. I went to Savannah for a few days in March of this year and had a blast. I walked on the waterfront, but after dark, and I would say that there is far less of a need for a streetcar there than here. Sure since it's free it beats walking, but there isn't a ton to do on that mile stretch. The only difference I would say would be cost for us vs. cost for them. That street is mostly cobblestone, so would that be cheaper to lay track on than an asphalt street? I remember the street actually being uncomfortable to walk on, but it would probably be easier to dig out a few stones than tear up a street for streetcar tracks. 1. The Savannah line is a starter. Its not the end all. Its the beginning of something that could one day serve their entire historic district. Its only been operating this year and they are already talking about expanding it into areas away from the riverfront. 2. Mass transit has to be designed for the community it will serve. If a streetcar were built here solely to serve tourist, it would struggle to attract riders unless it were at the beach. On the other hand, we have a number of walkable urban core neighborhoods located less than a mile from downtown. A line tying them together would be more beneficial to local residents who live and work in these areas. The side benefit to this is, it could also tap into the small tourist market that we have downtown and encourage walkable infill in the desolate areas that surround downtown. So, I'd say we need it more than Savannah does. Their mile long starter line used existing abandoned track from NS and one restored streetcar. There was no real construction involved. This is why it cost them less than $1.5 million to get it up and running. Although River Street has a lot of stores and eateries, it is more of a toursit area. My family lives up there, and when we go out downtown it is to the areas between Bay St and Liberty, such as Broughton St or City Market. Since many of the downtown areas already have heavy foot traffic, they will already have the people and the infill to support it, should they decide to expand the line futher out. Seeing the way they have really re-energized their downtown in the last 8 years that my family has lived up there, I have no doubt they will take advantage of the success of their street car to better improve their downtown. It seams that there is already a JTA "trolley" like bus that serves that area of Jacksonville. What is the ridership? Not to beat a dead horse... but if the Rosa Parks Station was more accessible to parking, i.e., a catwalk from the open- to-the-public FBC parking garage, I believe a lot more downtown workers would ride it. Also, would a catwalk from Laura St over State St. to Rosa Parks solve the oft mentioned separation of DT from Springfield? And again I ask, why are we waiting for COJ to do this? Have we not heard of the budget crisis? Why can't private enterprise and volunteers bring this project to fruition as demonstrated in other cities featured here?